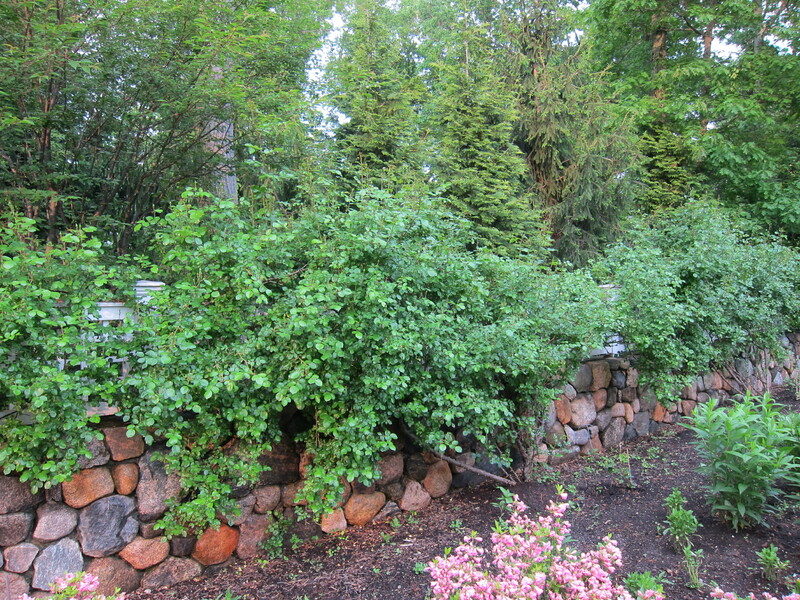 I am not sure if it is courageous or foolhardy, but I agreed to show my garden on tour this year. On Saturday, an as yet unknown number of strangers will descend and fan out across the garden, wielding their opinions and judgments. I fear for my innocent garden in the face of all those opinions! 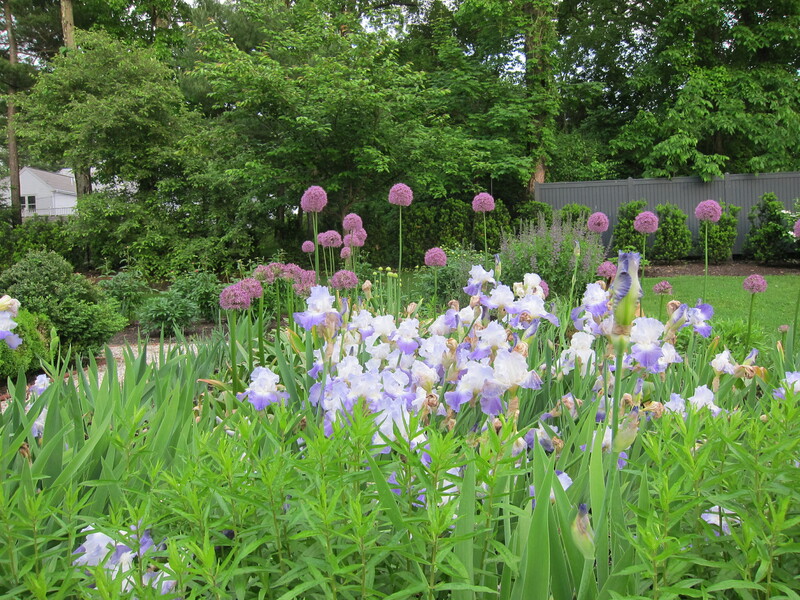 Amy is a Master Gardener, and a student Landscape History at the Landscape Institute in Boston. Amy designed the current garden from scratch. Before 2005 another house stood on the present site. 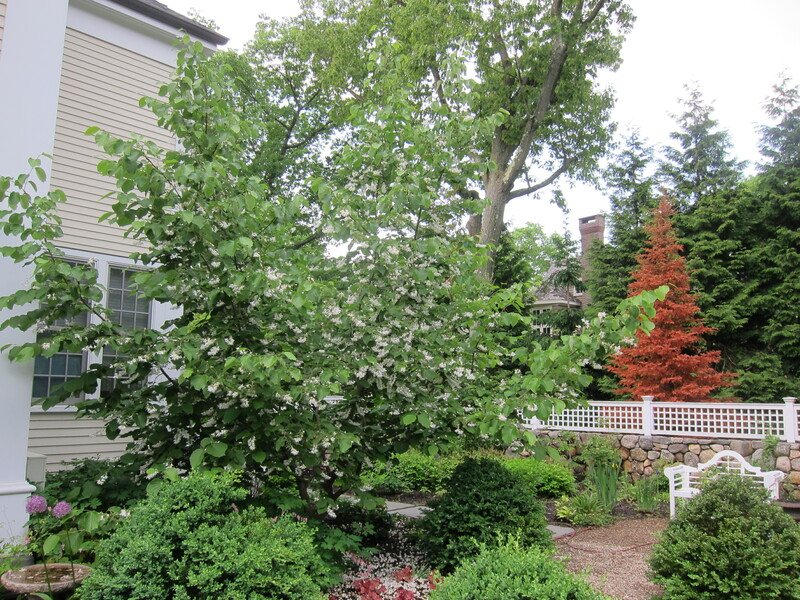 The previous house was leveled and the property reconfigured to its present condition. Starting with nothing but an idea and a lot of backbone, Amy designed the garden and planted, by herself, almost all the plant material (with the exception of the large trees and some larger shrubs). Amy likes to plant small because 1) it is less expensive and 2) she is then able to do it herself. Peonies are Amy’s favorite flower. 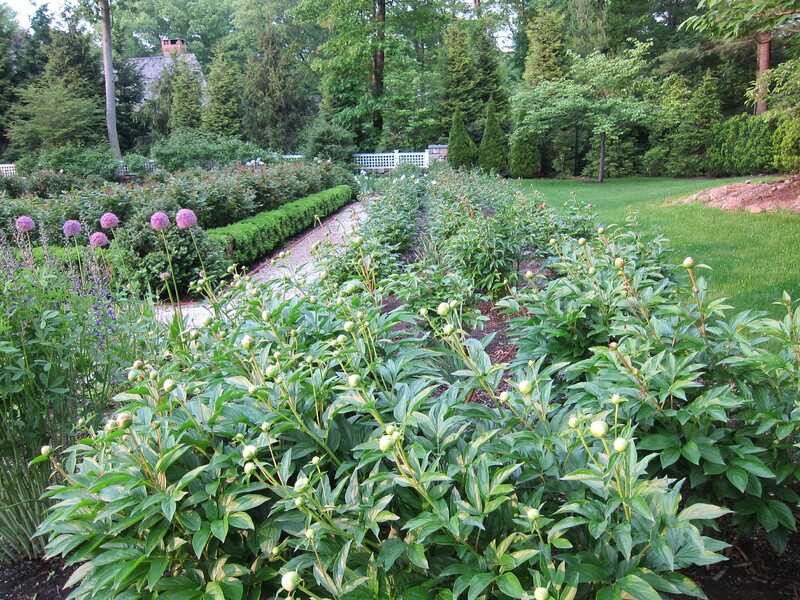 The initial peony bed, the one in front of the yew hedge to the left of the house, was planted in 2006. 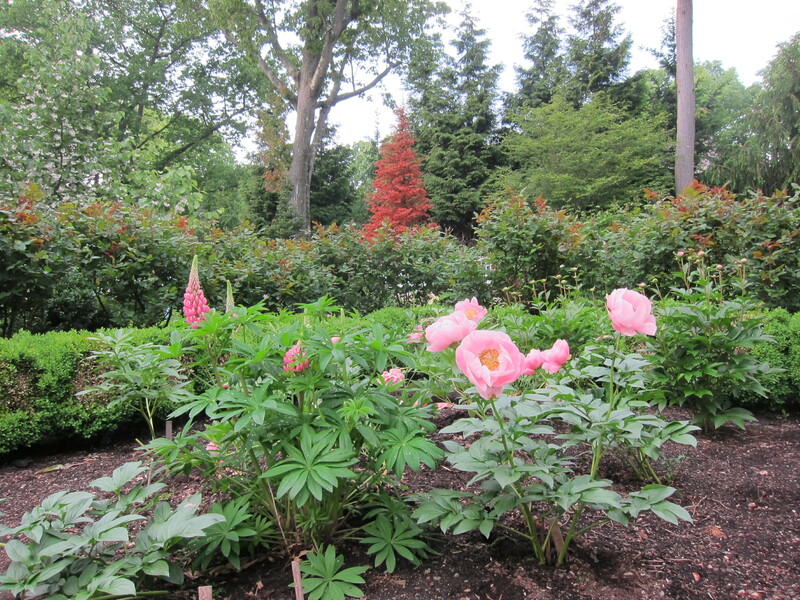 The long peony border, which is along the back of the formal garden, was planted in 2010. The three peony beds within the middle of the formal garden were planted in the fall of 2012 to celebrate a seminal year in Amy’s life (as was the Scarlet Oak / Coccinea Quercus in the front left of the front garden) Amy’s current project, begun in 2011, is the White Border along the stone wall. This border has been slow to progress since finding the specific white perennials desired is proving difficult. The garden has a winter, spring and fall focus. At this point in the process of preparing my garden to go on tour I have completely lost perspective. I ask myself (and everyone else in earshot) Is it a nice garden? Is it worthy to go on tour? Should I have waited another year? Should I have pulled out that lavender? Should I have put in that chamaecyparis? In two days time, I may have some answers to these questions. Your garden is gorgeous – even in November. Only a boor would not recognize that! Anyway do you have to be the docent at your own garden? We are doing a tour in July but we gather other volunteers to be there – a little map w/plant directory is helpful as many people come to tour because it is a great learning experience. Your beautiful garden will be a wonderful treat! THANKS Peggy! Your encouraging words are much appreciated. I love your garden. It looks beautiful and, like you, peonies are one of my favourites. Your Chelsea Show photos are an inspiration also. Happy gardening! Looking at your beautiful pictures taken in the garden I am amazed at how expansive it has become. Of course you know where you started and how much has been accomplished, but perhaps as you say, it’s hard to be objective when you’ve been laboring and looking at it continuously in preparation. Everything looks so healthy and lush and the colors vibrant. You’ve created a piece of art and now your audience will come and view it and interpret it from their own perspective as one does any other piece of art. Enjoy sharing it! Looking at the pictures you have nothing to worry about, as it all looks quite splendid. Maybe you have a college age son or daughter living at home who might be willing to help on the big day (I would offer my own but she never gets up early enough to do anything much at all, and on those rare occasions when she does something useful she then sends me a bill with a ridiculous hourly rate! Not sure where I went wrong in the upbringing there). I like the idea of plying the doubters with white wine, but it must be cheap wine, a bit sweet and a bit too warm, one does not want to actually encourage such boors. One of your commenters suggested placing such individuals on the compost heap, which I find a bit worrying, as they might have too much protein and prevent proper breakdown of the real organic matter……. So, don’t worry, be happy and (just a tiny bit) proud of your accomplishments. Also, I do hope to actually meet you one day! Maybe soon even. When the peonies are in full bloom would be best as they are among my favorite flowers, along with snowdrops and violets. Good luck tomorrow! Looks gorgeous. What garden tour are you on? What tour are you on? It all looks beautiful. I hope you are having a great day! Thanks! All went well; it was good fun. never pull out the lavender!!!!! looks gorgeous, sad i missed the big event! Wow! I hope it went well–I know it went well as your garden is absolutely beautiful. And now your peonies must be stunning. Thank you daseger, it was a big success!